The Orioles scored four runs in the top of the sixth inning to come from behind and beat the Red Sox 7-4 in the second game of their Saturday day/night doubleheader at Fenway Park. Baltimore had jumped out to a 2-0 lead in the top of the fourth inning on a two-run blast off Boston starter John Lackey by Nick Hundley. The Red Sox answered back with four runs in the bottom of the inning including two on Stephen Drew's second home run of the day. 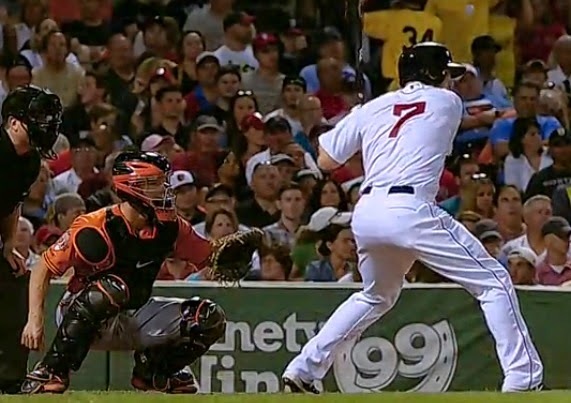 The other Boston runs came on RBI hits by Brock Holt and Daniel Nava. Orioles left fielder Nelson Cruz was a constant thorn in Boston's side with a five-for-five performance, falling just a triple short of the cycle. Lackey matched his season high with eleven strike outs. He went 5.1 innings, charged with five runs on ten hits. He only walked one.